Map of the train and subway systems. The men on the right are lined up waiting for the pachinko parlor to open. Some girls inside the door were preparing some potted plants - I guess for the first few customers. You really can't take 50 steps without finding another bank of vending machines. Plastic food. Most restaurants have windows like this, and list all their prices. All the shops on the right are built directly under the railway. Hello Kitty shop. This isn't just for tourists - Kitty-chan is popular with everyone. Health and beauty store, I think. There's a lot of pink, but that could mean anything. Beautiful shrine where I tried to do everything correctly, but it's difficult while juggling a purse, bag and umbrella. Remembered the Japanese words for incense and charm, though, so all that time with the monk wasn't completely wasted. 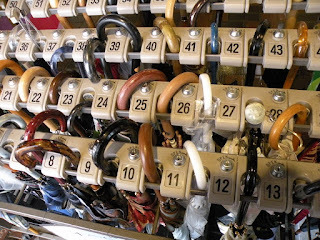 Umbrella locker at the Tokyo Metropolitan Museum of Art. An umbrella locker is the best idea ever!